Fairies and Gnomes, Unicorns and Leprechauns! 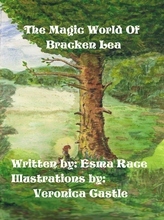 A Beautifully Illustrated collection of ten short stories all about life in the Bracken Lea Wood. The magical things that go on behind the scene that us Humans seem to take for granted. What !! you think those flowers bloom on their own or the seasons just naturally come and go? Tell that to Queen Astrid and the Flower Fairies,or the Green Lady and the Snow queen. This is definitely a perfect bedtime story book with the short length of each magical story and will keep the kids imagination going. A Bit About the Author..